folder—instead of the original file’s folder as most people would expect. Going forward, when you make a copy of a Docs, Sheets, or Slides file on the web, you’ll be able to choose which folder to place the file in. This should reduce confusion and make it easier to organize your Docs, Sheets, and Slides files. 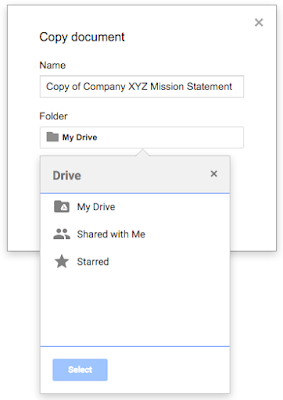 Update (August 5th, 2016): Please note that this feature is only available when making copies in Google Docs, Sheets, and Slides; the option does not appear in Google Drive. Previously, when you made a copy of a Google Docs, Sheets, or Slides file, that copy would be automatically added to your My Drive folder—instead of the original file’s folder as most people would expect. Going forward, when you make a copy of a Docs, Sheets, or Slides file on the web, you’ll be able to choose which folder to place the file in. This should reduce confusion and make it easier to organize your Docs, Sheets, and Slides files.